There are numerous different strains of carp and they all feed differently so rigs should be tested regularly! Females are generally easier to spot because their stomach is plump. Males retain a sleek 'torpedo' shape. When males are ready for spawning, they develop breeding nodules on the head and pectoral fins, principally along the bones of the fin rays. These appear as fine whitish raised spots. They are found in abundance on the pectoral fins and are rough to the touch. During breeding, the male nudges the female with his head and fins to encourage spawning. The Galician Carp, aka Galician Mirror Carp or Galician King Carp, is a very prolific breeder. The strain originated in Galicia, Poland and was bred by A. Gasch in 1900. The Redmire strain of Galician carp were spawned in Holland in 1932. Two years later, it was stocked into Redmire by Donald Leney of the Surrey Trout Farm for Lt. Col. Barnardiston to try to control weed growth. The Galician can grow up to 40lbs and look almost circular on occasions. Its body is compressed laterally, moderately elongate, and covered with large cycloid scales. It has a slightly forward facing down turned mouth. Galicians have both forks of the tail pointed. They are coloured dark on back, golden on sides, and the belly, pectorals and pelvics are light-yellow. Galicians have an orange ventral fin and a grey caudal fin with an orange shade. Coloration changes dependent on habitat. The Ropsha strain originated in Russia. Some sources say it came from Hungary. It is a hybrid fish produced between Amur wild carp and Galician carp. The Ropsha is a very long, lean looking fish. It has a down turned mouth. These carp rarely grow over 30lbs. Italian carp have a slightly forward facing mouth in a torpedo shaped head. The body is usually big and round. They are mainly grey in colour and will grow to over 40lbs. 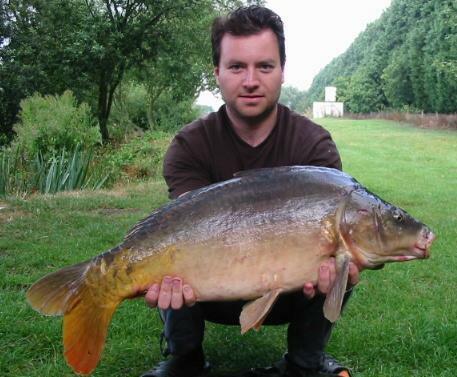 Italian carp can be found in the Waveney Valley Lakes in Norfolk or Savay. The Aischgrunder strain was developed in Aischgrund, Bavaria, Germany, during the past 300 years. Considered to be really ugly, it has an incredibly high, arched back and a slightly blunt and often upturned mouth. It is usually gold yellowish in color, although variations such as blue or complete lack of silvery shine are known. Aischgrunders are flat and grow fast, reaching 45lbs in ten years. The Frame Carp gets its name from the scale patterns running either along its back or flanks. It is a round fish and grows up to 40lb. These are stocked at Fishabil in France. The Royale Carp is characterized by distinctive 'humpy' shoulders and a low fairly straight back. Its scales tend to be very large and in the middle of the body along the lateral line. It is coloured in two tones. Some anglers consider it to be the best looking fish around. It has an exceptional growth rate of between 4 and 6lb per year. Royale Carp range in size from 26 to 40lbs. All of the above strains of carp can be caught in the UK, providing you target them with a good bait application. Many carp will eat most foods, but some do tend to prefer a food source that has been accepted as safe, thus, to catch them you need to do your homework. More information on all the different carp species from commons to leather carp here! http://www.carp-uk.net/forum/topic.asp?TOPIC_ID=23957 (Accessed May 6, 2007). http://www.northwestcarp.co.uk/forums/showthread.php?t=100&page=2 (Accessed May 7, 2007). http://www.northwestcarp.co.uk/forums/showthread.php?t=51 (Accessed May 6, 2007). http://wap.fishbase.org/physiology/strainlist.cfm?ID=1450 (Accessed May 6, 2007). http://www.maggotdrowning.com/forum/topic.asp?ARCHIVE=true&TOPIC_ID=30248 (Accessed May 6, 2007). Do Carp Have Good taste, smell & Vision? Different Types of Carp will change the type of rig needed when fishing!